A new series of definitive US stamps was introduced beginning in 1954. These new definitive postage stamps are referred to by American philatelists as the Liberty Issues or Liberty Series. The sheet-format Liberty Issues are presented on this page in groups, as they appear in the webmaster's United States stamp album. They actually look a lot better this way. The first type of definitive issues were portrait stamps with a picture frame around them. The later issues are more modern in fabric, and they have a completely different style to them. When all of these issues are combined in denomination sequence, as they are in the Scott catalog, they do look a little strange together. Not to worry though, the catalog detail sections for each of these groups of US stamps will have Scott catalog numbers. Though most of the sheet-format denominations of the Liberty Issue of US stamps were produced in the 1950's, additional printings of them continued into the 1970's! The 1960's was a time of many changes in printing and postal processing technology. As a result, some of these stamps exist on various types of papers, and some of them exist with phosphorescent tagging for processing by sorting machinery. To make this series of definitive US stamps a little easier to understand, these "constant varieties" will all be described in column three of this page. The images on this page consist of one example of each denomination, without regard to types. The description / catalog tables for each group will contain ALL of the types for each denomination, but all of them will not necessarily be illustrated. 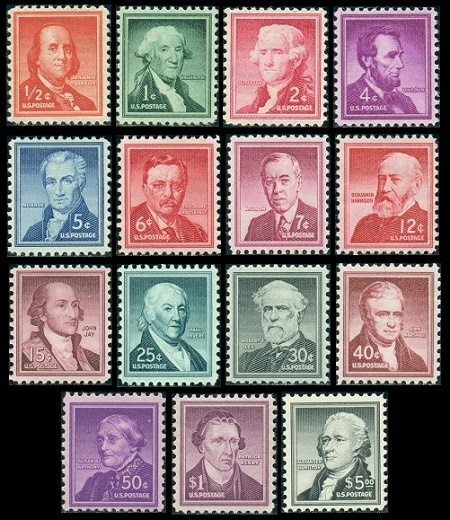 The fifteen Liberty Issue definitive US stamps shown above were all issued between 1954 and 1959, and they feature framed portraits of the famous people whose contributions have shaped American history. Eight of the fifteen denominations shown above were printed, utilizing the Wet Printing process between 1954 and 1955. All fifteen of the denominations shown above were printed, utilizing the Dry Printing process between 1954 and 1958. Three of the Dry Printing denominations were printed on phosphor coated paper between 1963 and 1968. 1/2 C. (1955 - Wet Printing - Sc. #1030a) - Benjamin Franklin - Red Orange. 01 C. (1954 - Wet Printing - Sc. #1031b) - George Washington - Dark Green. 04 C. (1954 - Wet Printing - Sc. 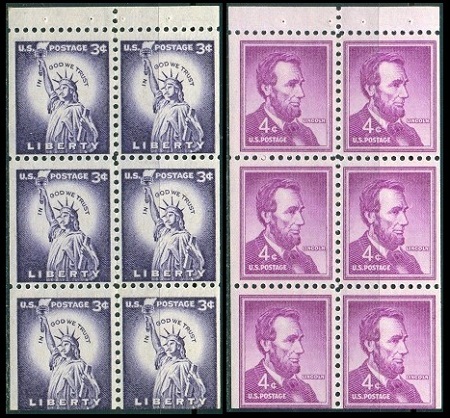 #1035e) - Abraham Lincoln - Red Violet. 06 C. (1955 - Wet Printing - Sc. #1039a) - Theodore Roosevelt - Carmine. 30 C. (1955 - Wet Printing - Sc. #1049a) - Robert E. Lee - Black. 40 C. (1955 - Wet Printing - Sc. #1050a) - John Marshall - Brown Red. 50 C. (1955 - Wet Printing - Sc. #1051a) - Susan B. Anthony - Bright Purple. 01 D. (1955 - Wet Printing - Sc. #1052a) - Patrick Henry - Purple. 02 C. (1954 - Silkote Printing - Sc. #1033a) - Thomas Jefferson - Carmine Rose (rare - certification required). 1/2 C. (1958 - Dry Printing - Sc. #1030) - Benjamin Franklin - Red Orange. 01 C. (1956 - Dry Printing - Sc. #1031) - George Washington - Dark Green. 02 C. (1954 - Dry Printing - Sc. #1033) - Thomas Jefferson - Carmine Rose. 04 C. (1954 - Dry Printing - Sc. #1036) - Abraham Lincoln - Red Violet. 05 C. (1954 - Dry Printing - Sc. #1038) - James Monroe - Deep Blue. 06 C. (1955 - Dry Printing - Sc. #1039) - Theodore Roosevelt - Carmine. 07 C. (1956 - Dry Printing - Sc. #1040) - Woodrow Wilson - Rose Carmine, Dark Rose Carmine. 12 C. (1959 - Dry Printing - Sc. #1045) - Benjamin Harrison - Red. 15 C. (1958 - Dry Printing - Sc. #1046) - John Jay - Rose Lake. 25 C. (1958 - Dry Printing - Sc. #1048) - Paul Revere - Green. 30 C. (1957 - Dry Printing - Sc. #1049) - Robert E. Lee - Black, Intense Black. 40 C. (1958 - Dry Printing - Sc. #1050) - John Marshall - Brown Red. 50 C. (1958 - Dry Printing - Sc. #1051) - Susan B. Anthony - Bright Purple. 01 D. (1958 - Dry Printing - Sc. #1052) - Patrick Henry - Purple. 05 D. (1956 - Dry Printing - Sc. #1053) - Alexander Hamilton - Black. 04 C. (1963 - Tagged - Sc. #1036b) - Abraham Lincoln - Red Violet. 12 C. (1968 - Tagged - Sc. #1045a) - Benjamin Harrison - Red. 15 C. (1966 - Tagged - Sc. #1046a) - John Jay - Rose Lake. 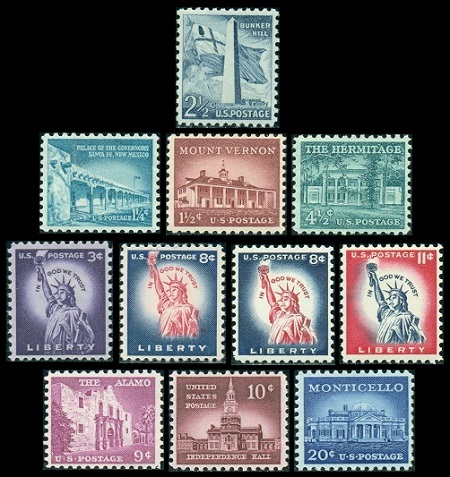 The eleven Liberty Issue pictorial definitive US stamps shown above were all issued between 1954 and 1961, and they feature designs that are symbolic of American freedom and patriotism. Only one of the eleven denominations shown above was printed, utilizing the Wet Printing process during 1954. All eleven of the denominations shown above were printed, utilizing the Dry Printing process between 1954 and 1961. Three of the Dry Printing denominations were printed on phosphor coated paper between 1966 and 1967. 03 C. (1954 - Wet Printing - Sc. #1035e) - Statue of Liberty - Deep Violet. 01 1/4 C. (1960 - Dry Printing - Sc. #1031A) - Palace of the Governors, Santa Fe, New Mexico - Turquoise. 01 1/2 C. (1956 - Dry Printing - Sc. #1032) - Mt. Vernon, Virginia - Brown Carmine. 02 1/2 C. (1959 - Dry Printing - Sc. #1034) - Bunker Hill Monument, Charlestown, Massachusetts and the Bunker Hill Flag of 1776 - Gray Blue. 03 C. (1954 - Dry Printing - Sc. #1035) - Statue of Liberty - Deep Violet. 04 1/2 C. (1959 - Dry Printing - Sc. #1037) - Hermitage, Nashville, Tennessee - Blue Green. 08 C. (1954 - Dry Printing - Sc. #1041) - Statue of Liberty - Dark Violet Blue & Carmine. 08 C. (1958 - Dry Printing - Sc. #1042) - Statue of Liberty - Dark Violet Blue & Carmine. 09 C. (1956 - Dry Printing - Sc. #1043) - The Alamo, San Antonio, Texas - Rose Lilac. 10 C. (1956 - Dry Printing - Sc. #1044) - Independence Hall, Philadelphia, Pennsylvania - Rose Lake, Dark Rose Lake. 11 C. (1961 - Dry Printing - Sc. #1044A) - Statue of Liberty - Carmine & Dark Violet Blue. 20 C. (1956 - Dry Printing - Sc. #1047) - Monticello, Charlottesville, Virginia - Ultramarine, Deep Bright Ultramarine. 03 C. (1966 - Tagged - Sc. #1035b) - Statue of Liberty - Deep Violet. 10 C. (1966 - Tagged - Sc. #1044d) - Independence Hall, Philadelphia, Pennsylvania - Rose Lake, Dark Rose Lake. 11 C. (1967 - Tagged - Sc. #1044c) - Statue of Liberty - Carmine & Dark Violet Blue. The 3 C. denomination and 4 C. denomination Liberty Issue US stamps were issued in booklets, containing panes of six stamps, between 1954 and 1958. Examples (reduced size) of them are shown above. 03 C. (1954 - Wet Printing - Sc. #1035a) - Deep Violet. 03 C. (1954 - Dry Printing - Sc. #1035f) - Deep Violet. 04 C. (1958 - Dry Printing - Sc. #1036a) - Red Violet. 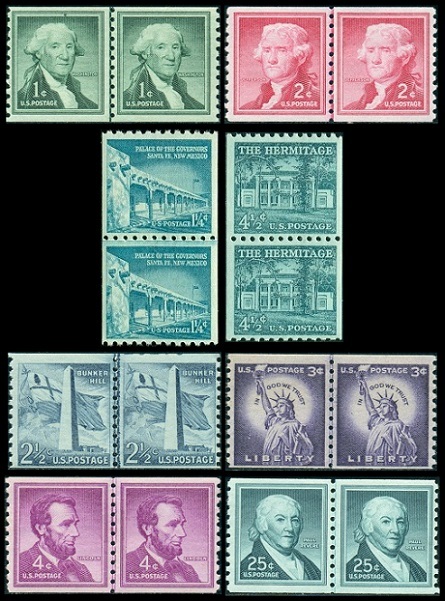 The eight Liberty Issue coil-format US stamps shown above (in pairs) were issued between 1954 and 1965, with some additional printings occurring as late as 1980. These coil US stamps can become a very complex group to collect. There are many varieties, having to do with variable printings, hole sizes, gum type, and phosphor tagging. Strangely enough, the small perforation holes and large perforation holes listings in the Scott U.S. Specialized catalog, though some of them are rare and very expensive, do not have separate catalog numbers! 01 C. (1954 - Wet Printing, Lg. Holes - Sc. #1054c) - Dark Green. 01 C. (1957 - Dry Printing, Sm. Holes - Sc. #1054) - Dark Green. 01 C. (1960 - Dry Printing, Lg. Holes - Sc. #1054) - Dark Green. 01 1/2 C. (1960 - Dry Printing, Sm. Holes - Sc. #1054A) - Turquoise. 01 1/2 C. (1960 - Dry Printing, Lg. Holes - Sc. #1054A) - Turquoise. 02 C. (1954 - Wet Printing, Lg. Holes - Sc. #1055d) - Carmine Rose. 02 C. (1957 - Dry Printing, Lg. Holes - Sc. #1055) - Carmine Rose. 02 C. (1961 - Dry Printing, Sm. Holes - Sc. #1055) - Carmine Rose. 02 C. (1968 - Tagged, Sm. Holes, Shiny Gum - Sc. #1055a) - Carmine Rose. 02 C. (1968 - Tagged, Lg. Holes, Dull Gum - Sc. #1055a) - Carmine Rose. 02 1/2 C. (1959 - Dry Printing, Lg. Holes - Sc. #1056) - Gray Blue. 02 1/2 C. (1961 - Dry Printing, Sm. Holes - Sc. #1056) - Gray Blue. 03 C. (1954 - Wet Printing, Lg. Holes - Sc. #1057c) - Deep Violet. 03 C. (1961 - Wet Printing, Sm. Holes - Sc. #1057c) - Deep Violet. 03 C. (1956 - Dry Printing, Lg. Holes - Sc. #1057) - Deep Violet. 03 C. (1958 - Dry Printing, Sm. Holes - Sc. #1057) - Deep Violet. 03 C. (1967 - Tagged, Philatelic Printing, Sm. Holes - Sc. #1057b) - Deep Violet. 03 C. (1966 - Tagged, Look Printing, Sm. Holes - Sc. #1057d) - Deep Violet. 04 C. (1958 - Wet Printing, Lg. Holes - Sc. #1058b) - Red Violet. 04 C. (1958 - Dry Printing, Lg. Holes - Sc. #1058) - Red Violet. 04 C. (1958 - Dry Printing, Sm. Holes - Sc. #1058) - Red Violet. 04 1/2 C. (1959 - Dry Printing, Lg. Holes - Sc. #1059) - Blue Green. 04 1/2 C. (1959 - Dry Printing, Sm. Holes - Sc. #1059) - Blue Green. 25 C. (1965 - Dry Printing - Sc. #1059A) - Green. 25 C. (1973 - Tagged, Shiny Gum - Sc. #1059b) - Green. 25 C. (1980 - Tagged, Dull Gum - Sc. #1059b) - Green. 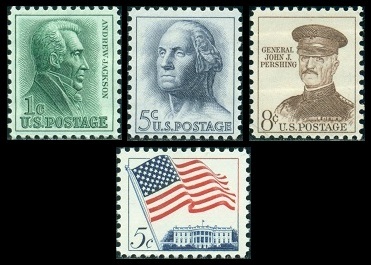 The four definitive sheet-format US stamps shown above were all issued between 1961 and 1966. These stamps, as well as all the US stamps printed since the end of the 1950's, were all printed utilizing the Dry Paper process. 05 C. (1963 - Not Tagged - Sc. #1208) - Flag over the White House - Blue and Red. 05 C. (1962 - Not Tagged - Sc. #1213) - George Washington - Dark Blue Gray. 08 C. (1961 - Not Tagged - Sc. #1042A) - John Pershing - Brown. 05 C. (1966 - Tagged - Sc. #1208a) - Flag over the White House - Blue and Red. 05 C. (1963 - Tagged - Sc. #1213b) - George Washington - Dark Blue Gray. The 1 C. denomination and 5 C. George Washington denomination was also issued in horizontal coil-format between 1962 and 1966. 05 C. (1962 - Not Tagged - Sc. #1229) - George Washington - Dark Blue Gray. 01 C. (1966 - Tagged - Sc. #1225a) - Andrew Jackson - Green. 05 C. (1963 - Tagged - Sc. #1229a) - George Washington - Dark Blue Gray. The 5 C. George Washington denomination was also issued in booklets, containing panes of five stamps plus a label, between 1962 and 1963. 05 C. (1962 - Not Tagged - Sc. #1213a) - George Washington - Dark Blue Gray. 05 C. (1963 - Tagged - Sc. #1213c) - George Washington - Dark Blue Gray. Up until 1953, engraved US postage stamps were printed on paper containing a moisture content of 15% - 35%. Stamps printed in this manner are referred to as Wet Printings (shown above at the left). In 1953, the Bureau of Engraving and Printing began experimenting with printings on a drier paper containing a moisture content of 5% to 10%. The new process required a thicker, stiffer paper, special types of inks, and greater pressure to force the paper into the recessed plates. Stamps printed in this manner are referred to as Dry Printings (shown above at the right). The Dry Printings show whiter paper, a higher sheen on the surface, feel thicker and stiffer, and the designs stand out more clearly. 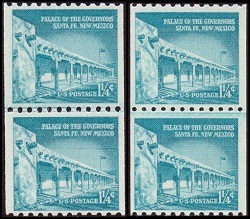 Silkcote paper was used for a special printing of 2 C. denomination stamps in 1954. The experimental paper was chemically treated with an optical brightening agent. The stamps were put on sale for a short time at the Westbrook, Maine post office in December 1954. They are very rare today. In 1963, the United States Post Office began testing automated mail-handling equipment to detect, cancel, and sort mail by sensing an ultraviolet light afterglow from paper treated with phosphorescent substances. Regular definitive and commemorative stamps, in time, were "tagged" with a yellowish green glowing zinc orthosilicate compound for use with the automated equipment. The "phosphor coating" or "phosphor tagging" is invisible to the naked eye, and it can only be detected with a shortwave ultraviolet light. A photograph of a coil-format pair of the 2 C. denomination Liberty Issue stamp, giving off the yellowish green "glow" is shown above. By the beginning of 1967, almost all definitive, commemorative, and airmail stamps, and all postal stationery were "phosphor tagged". During the lifetime of the Liberty Issue coil-format stamps, a change was made from using 384 subject plates to using 432 subject plates, with the size of the perforation holes reduced. While both are perforated 10, the holes on the 432 subject plates are smaller than the paper between them. The difference is most notable on coil pairs, by comparing the two sizes, from where the coil stamps are joined together in the middle.